Bitfenix is best known for its line of computer cases, but it began dabbling in power supplies last year with the introduction of its Fury line. Now it's launching a second line of PSUs, the Whisper series, which as the name implies is focused on noise management. "Thanks to the use of an Intelligent fan control curve and a 135mm FDB fan that starts working at a much lower voltage of 3.5v the fan can operate at 500rpm ± 10 percent. Because of these unique features together with ultra-low noise levels and high life expectancy of the fan, BitFenix Whisper can operate at noise levels lower than 18dBA while PSU load is lower than 60 percent at 25C," BitFenix claims. The new Whisper PSUs are available in 450W, 550W, 650W, 750W, and 850W models, each one sporting 80 Plus Gold certification for efficiency. They're also fully modular with detachable flat-ribbon cables that tuck into nooks and crannies a bit easier than braided cables. 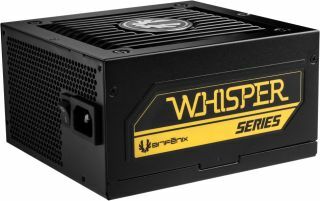 With the release of the Whisper series, Bitfenix renews the debate of which is better, a single +12V rail design or having multiple +12V rails. Bitfenix opted for a quad-rail configuration. The company's reasoning is that "a dedicated quad rail design together with an advance voltage switching circuit from +12V to minor rail provides the best stability and output quality." Bitfenix also claims to have a handle on ripple and line noise due to the use of solid and industrial Japanese capacitors. The new power supplies are backed by a 7-year warranty. We've reached out to Bitfenix for information on pricing and availability and will provide an update once we hear back.